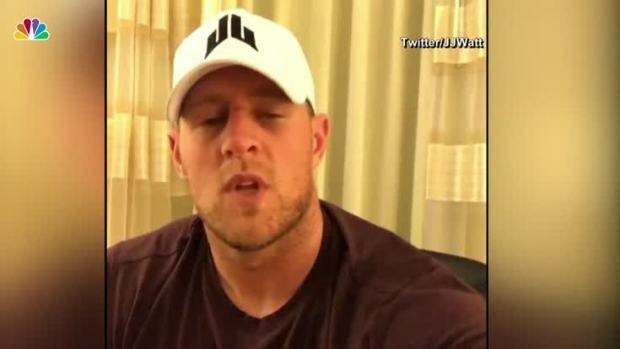 J.J. Watt durante los días posteriores al paso del huracán Harvey sobre Houston. Houston Texans star J.J. Watt said Monday that he has distributed the $41.6 million his foundation raised to help rebuild the Texas Gulf Coast after Hurricane Harvey. An online fundraiser Watt launched after the storm hit Texas last year went viral and far exceeded his original goal of raising $200,000. "It's incredible to see just the generosity of strangers and what it's able to do and what it's able to accomplish, and the fact that that's just year one," Watt said. "We still have more to do and we still have a lot going on moving forward." Watt routed the money to eight groups actively involved in Texas' rebuilding and recovery. According to the Texans, the funds have already been used to clean up and rebuild more than 600 homes, distribute more than 26 million meals and provide health care to more than 6,500 people. Houston Texans defensive end J.J. Watt announced on Twitter that he was starting a fundraiser to help the recovery effort in Houston after Hurricane Harvey caused massive damage. Watt himself donated $100,000 to the cause. The three-time NFL Defensive Player of the Year has dealt with serious injuries in each of the last two seasons, playing just eight games combined in 2016-17, though he's back and healthy now. He said working on this project and seeing how people came together to help others in such a huge time of need was good for him. "As you look back on it, you really understand how incredible it really was and how thankful that I am for so many people to help out and to be willing to help out," Watt said. "I was going through some tough times myself the last two years, so I think that it really helped show me the good side of people and that I should have hope and ... have positively." Houston coach Bill O'Brien said he spoke to the team Monday about the impact Watt's fundraiser had on the community, and he raved about his superstar defensive end. "I don't even know if words can describe that, what he's meant to the city of Houston, everything that he's done," O'Brien said. "He was hands-on with it. He's been hands-on with how to distribute the money, where it goes, all those things. We have a great deal of respect for what he's done, and I know the city does, too." 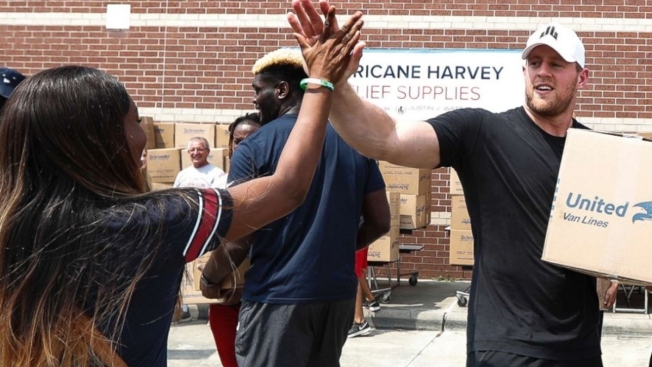 Watt, who is entering his eighth NFL season, talked about how moved he was that everyone from celebrities to children with lemonade stands helped raise funds to help the victims of the storm, which made landfall last Aug. 25 and left torrential flooding in its wake. He said he felt a lot of pressure to make sure the money was used to make the biggest impact in areas where it was needed most. "Obviously, I wasn't planning on being in such a wild situation from the start, but I had an incredible support team around me and I had tons of people help me out," he said. "We did loads and loads of research and we spent hours and hours doing the phone calls and the meetings and talking with everybody and gathering as much information as we could, so we could do it the right way." "Because that's the only thing that we wanted out of all of it -- we wanted to do it the right way and make sure that we did proud to people who trusted us," Watt said.